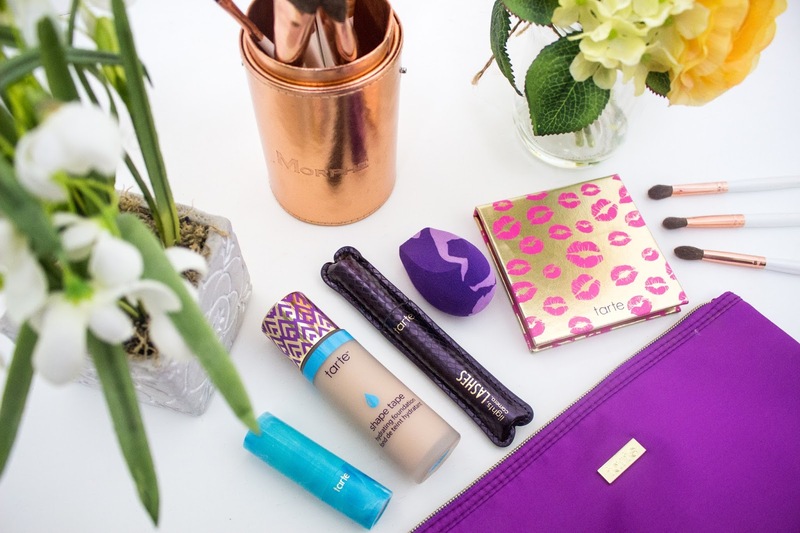 I gravitated towards the hydrating foundation as I am always looking for that glowing and dewy finish to my skin, rather than a matte finish (however it is available in matte as well if you do suffer from oily skin). 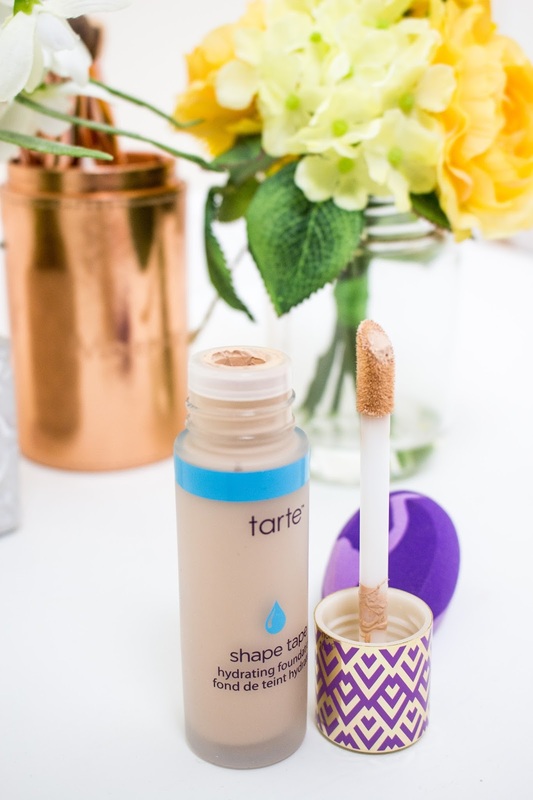 When it first arrived, I did really like how it was packaged as it is a much larger version of the Shape Tape Concealer and even has the same doe-foot applicator (bit is a bit larger). I do like how heavy the glass bottle feels and the purple and gold geometric print on the lid. 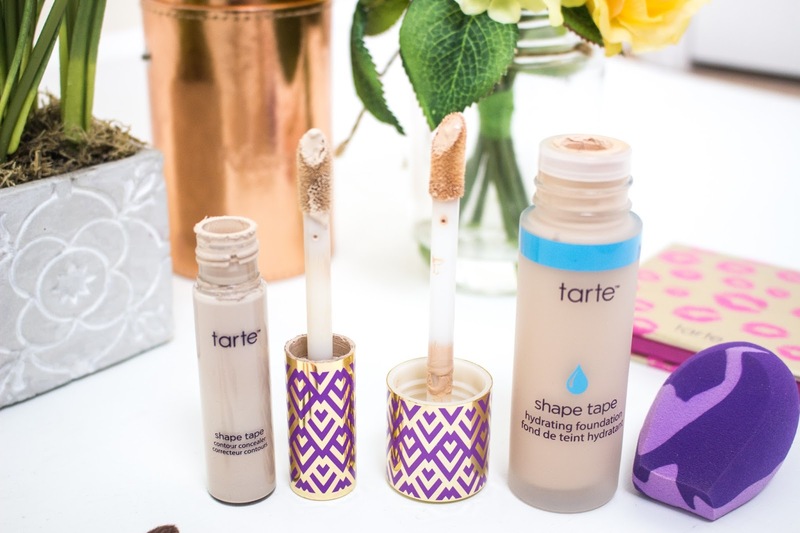 I think the bottle looks so sleek, especially when next to the Shape Tape concealer (that I love so much). However, it does not blow my socks off, especially with a £35 price tag. However, it is not all about the packaging and it is really all about the formula of the foundation and whether it lasts all day! 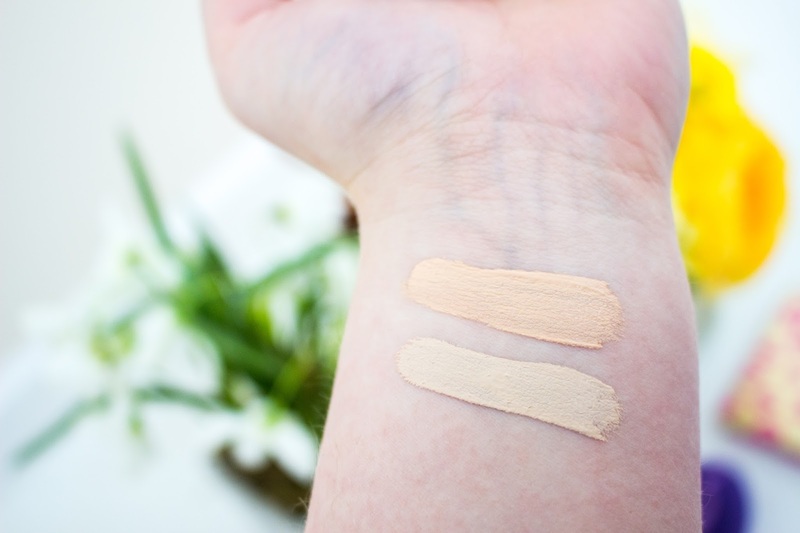 When I first applied this foundation to my skin, it did feel quite fresh and cooling on the skin so I knew that it would be great for my skin as it didn't feel heavy and it didn't cling to any dry areas on my skin. I didn't really know the best way to apply this foundation or how much to put on my skin as I don't own any other foundation that comes with a doe-foot applicator. I am so used to foundations with a pump and I would either put the product on my hand or apply it directly to a BeautyBlender or brush. At first, I applied a few stripes of foundation on my cheeks, chin and forehead and then blended it in with a BeautyBlender (I do have the new Tarte sponge but have not tested it out yet). I do feel like the doe-foot applicator did not speed up applying my makeup at all and seemed a bit pointless. 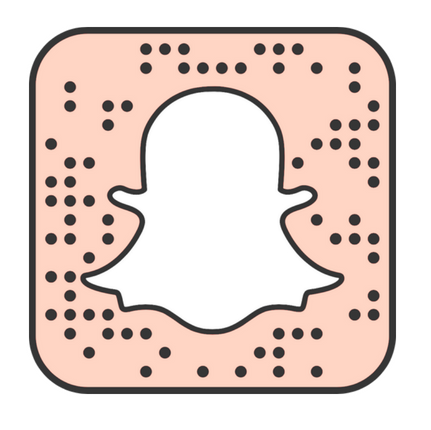 When I first blended it in, I was not that impressed as it looked really streaky on me, however after another coat was applied, it blended out really nicely and made my skin look amazing. I am not sure why it looked streaky to start off with: it was either I had not put on enough foundation, the sponge was slightly too wet or it could have been the fact that I was using intense beauty lights and it was picking it up even more as when I applied this foundation in natural lighting, it looked even and not streaky. I would however say that this is definitely more of a medium coverage foundation and therefore if you want a fuller coverage as I didn't know how much to apply and I found it quite difficult to get a lot of product onto the applicator. I would have to dip back into the foundation 3-4 times to get a full coverage and I just think a pump would have been a lot easier to use. I really do love the finish of this foundation (even if at first I was not a massive fan). I definitely need to apply two layers of foundation to get the coverage that I desire, but as soon as I have applied my concealer and set it all with powder the finish is beautiful. My skin looks so healthy and glowing, plus it doesn't cling to any dry areas. 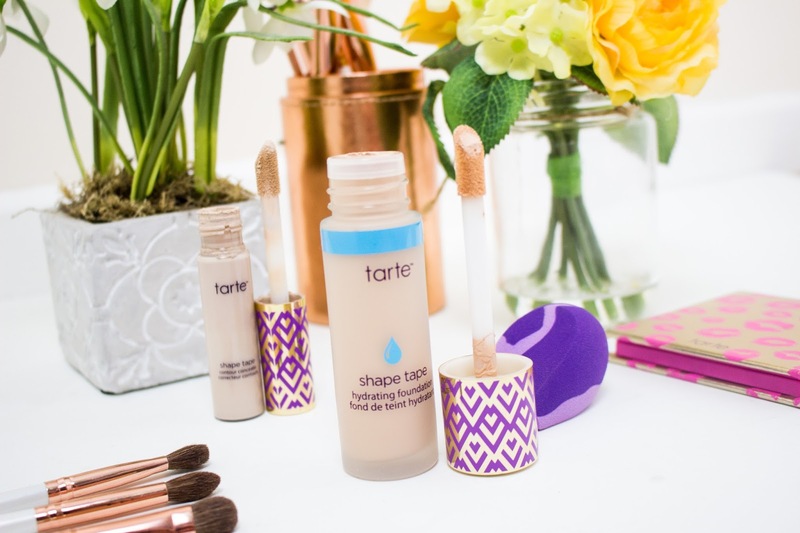 It feels lightweight (almost like I am wearing no makeup at all) and it blends beautifully with the Shape Tape concealer. I found it so easy to blend with a BeautyBlender and I like the fact that it doesn't dry down straight away so I have time to make sure that everything is blended out evenly without worrying about it drying down too quick. Also, I loved the fact that it does give ma glowing and dewy finish to the skin once blended and this is something that I really like to see in a foundation. I did set my foundation with a translucent powder which mattified it slightly but even then it still looked beautiful. It also didn't seem to crease under my eyes, although I noticed that when I applied it to my eyelids and I didn't set it with powder that it did crease slightly. Therefore, I would recommend using some sort of powder to set it, to make sure no creasing happens. I do feel like this is not going to be a foundation for someone with oily skin as I can imagine it will be too dewy and could break down if you product a lot of oil. I did see a review where someone say that this is not for someone who suffers from oily skin, however, it is great for anyone who has normal to dry skin. My foundation shade is Fair-Beige which is the perfect shade for me as it has a slight cool undertone to it. There were only 6 shades available on QVC but there are 18 shades available on the Tarte website. Often with some foundations, they can oxidise and end up looking either too dark or slightly orange, but this foundation did not oxidise at all. In fact it stayed the same shade throughout the whole day and looked perfect from morning to night. I found that this foundation lasted all day on me, although I had set it with loose powder and pressed powder. However, I wore it for around 12 hours and there was only some signs on foundation separating but it was not too visible. After trying this foundation, I am intrigued to try the matte version as I have heard that is a more full coverage foundation and I do find that matte foundations can sometimes look good one me if I really blend it out for a long time. Did this foundation knock my socks off? The answer is a bit more complicated than saying yes or no. Overall, I loved the finish that this foundation gave me. When I first applied it I was not that keen because it did look streaky but once I applied a second layer it was more full coverage and looked more even. I really like how it makes my skin look healthy, glowing and dewy without making my skin look oily or wet. I think this foundation is great for anyone with normal to dry skin, however I don't think it will work for anyone with oily skin as it does leave a glowing and dewy finish. When it comes to application I have only blended it in with a BeautyBlender and not a brush, as I am not a huge fan of applying foundations with a brush. The application was really easy to blend into the skin and it did leave my skin feeling so soft - although I would definitely recommend using a moisturiser and primer underneath for the best results and to help make it last all day. However, I do have a few problems with this foundation. Firstly, I do not agree with the shade range of this foundation and think that a lot more shades could have been brought out and they should have brought out more shades for deeper complexions (hopefully they will add more shades soon). 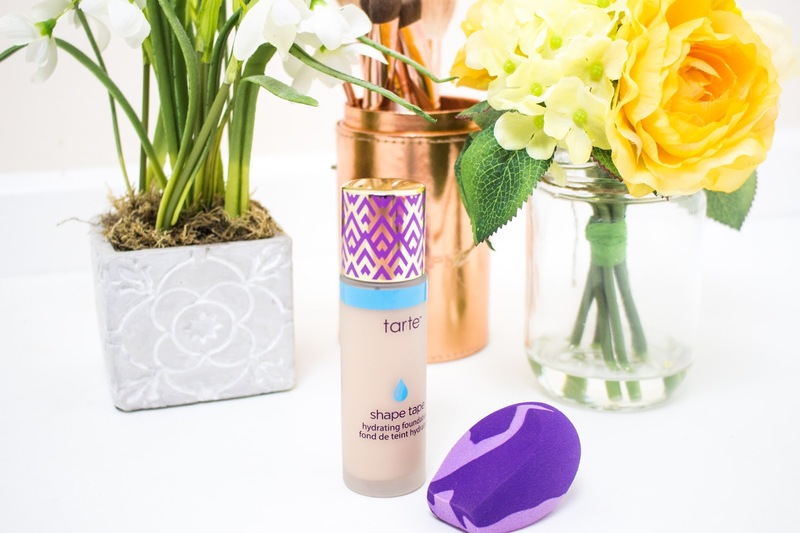 Also, I have read quite a few reviews that have said that this foundation is just the repackaged version of the Empowered Hybrid Gel Foundation. I have never tried this foundation so cannot comment whether this is the exact same formula but I am not a fan of when brand repackage products that have not sold well and make it seem it is something new. The foundation itself is really nice, although I do have just as many great foundations in my makeup collection. However, if you want a really dewy foundation then this is a great choice. All I will say if I am not a fan of the fact that the shade selection was so limited and it is reported to be a repackaged foundation. But I do think this is a pretty foundation that makes my skin look flawless after a couple of layers and I have been complimented on the way my skin looks every time I have worn this. So, I think that this will be a foundation I will repurchase in the future just because of the finish it gives me (it makes my skin look filtered), but it is a personal preference and I still don't agree with everything surrounding this foundation. However, I do like how this foundation looks on my skin! 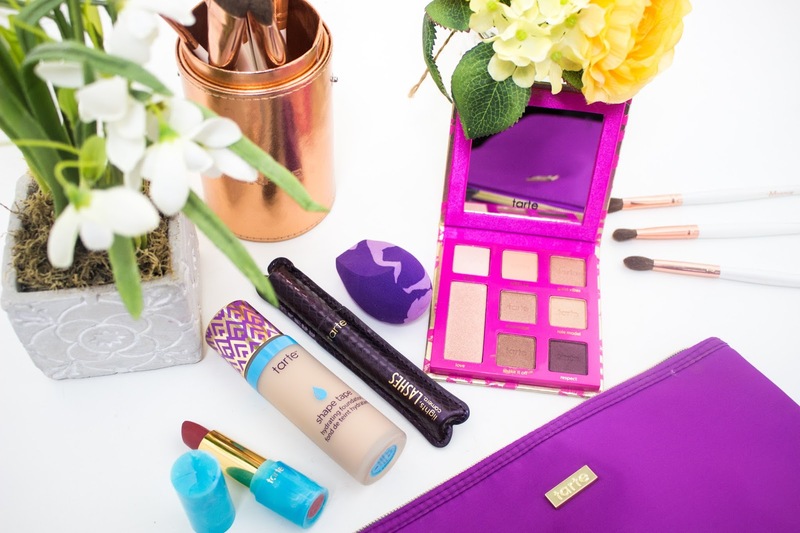 The Tarte Hydrating Shape Tape Foundation and the Matte Shape Tape Foundation retails for £35 or can be purchased in a set from QVC (with five Tarte products and a makeup bag)for £70.